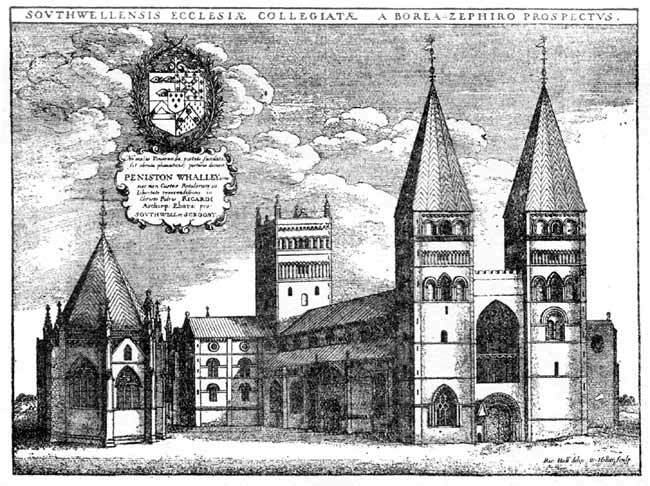 Southwell Minster in 1672. From Hollar's print in Thoroton's 'Nottinghamshire'. One further point is interesting. In the Hollar engraving, the north-west tower is shown pierced by a large window, the wall of the companion tower being blank. In all other views of the Minster up to 1850, when it was removed, a Decorated window appears in the south-west tower. If Hollar can be relied upon, this window may be surmised to have come from the Booth chapel, either in 1784, or after the re-construction in the time of Thoroton, and judging from the character of the tracery1 it belonged to the earlier building which the first Booth restored. "In the south aisle . . . is a plain blue stone marking part of the pavement, round the margin of which is a short inscription. The only legible part contains the name of 'Wilhelmus Booth, ob. 1464.' He was buried in St. John's Chapel, of which he was the founder, and from whence this stone was at some time after removed. Near to this stone, fixed in the wall of the the south aisle, is an altar tomb to Lawrence Booth (the 53rd Archbishop), half brother to the last mentioned Booth who died in 1480. Close to this stood the Chapel of St. John, afterwards converted into a grammar school, from which it appears that the former stone was removed to its present situation at the time of its demolition. Thus she founder was turned out of doors, while his more, perhaps, prescient brother retains his station in the wall, the outside of whose tomb forms a part of its face." Alas for the prescience of the younger Booth—the wall fell down in 1847, destroying the tomb in its fall, and no part either of stone or tomb is now to be found in the Minster. Perhaps in an old sketch book yet hidden away among the treasures of some old Southwell family, there may one day be found a view of Booth's chapel which will set all conjecture as to its appearance at rest. Meantime the Mason pictures will help us to realise what the chapel was like in the closing years of its existence. No doubt long before 1784, it had lost most of its early characteristics, and had become an eyesore to our Georgian ancestors, but its demolition though explainable is hardly excusable. In the Southwell Chapter minutes, dated 21st April, 1774, there is the following reference to the chapel :— "Decreed that the Grammar School House be repaired in such necessary manner as the next Residentiary shall direct, and that the expences of such repairs be paid out of the Fabrick account." "On Thursday, the twelfth day of August, in the year of our Lord, one thousand seven hundred and eighty-four, in the Chapter house of the Collegiate Church of the Blessed Mary the Virgin of Southwell, in the County of Nottingham, between the hours of eight and twelve of the clock in the forenoon of the same day, before the Venerable Peter Peckard, Clerk, M.A., William Rastall, Clerk, D.D., and Richard Kaye, Clerk, LL.D., Prebendaries of the respective Prebends of Rampton, Norman-ton, and North Muskham, capitularly met together and making a Chapter among themselves, in the presence of me George Hodgkin-son, Notary Publick Register. Decreed: that Mr. Peckard shall hire a proper room in the house call'd the Red Prebend for the purposes of a School. Decreed: that Mr. Peckard immediately take down the present School and Library and apply the materials thereof to the building of a new Library, and that the materials which are not wanted be sold and the money arising from the sale applied to the same purpose." In 1900, Mrs. Trebeck gave to Archdeacon Richardson a ring of which its former owner, the Rev. Alfred Tatham, one of the last minor Canons of the old Foundation, has left this account:—"In the year 1847 it was found necessary to remove a window and some of the ashlar work where it was known that Archbishop Booth's Chapel stood. In doing this a skeleton was found, and from one of the fingers the ring was taken by John Lane, master mason. He said nothing to any person at the time it came into his possession. He died shortly afterwards, and on his death bed requested his son to give it to me. Alfred Tatham." This ring is now kept in the library of the Minster. A silver gilt ring, which was stated to have been found in the grave of Lawrence Booth, was exhibited by Mr. C. H. Fowler at a meeting of the Society of Antiquaries, on January 22nd, 1880. This apparently is not the ring which was given to Archdeacon Richardson, and it is to be hoped that it may some day be likewise placed in safe custody in the Minster. More evidence of what was discovered when the foundations of the chapel were disturbed in 1847 would be of interest. (1) A sketch of this window is given in the Rev. G. M. Livett's invaluable little guide to the Minster. It may be noted, as the mistake was repeated on the plan reproduced in " the Builder," that the date of the destruction of the chapel is incorrectly given as 1847 on page 69 of this guide.